Did you know that Knickernappies produces FIVE different types of inserts? Each is unique in it's own way and serves it's own purpose. I'm going to share with you below, the five different types and what each can do for you! 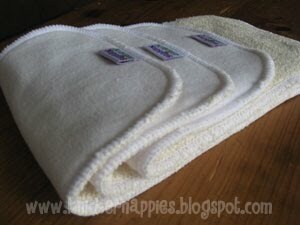 Knickernappies Stay-Dry Hemp Doublers- Lay doubler on top of any type of diaper to boost absorbancy. To keep wetness away from your baby's skin, lay the fleece side next to baby. For potty training, simply turn the doubler over to the hemp side so baby feels the wetness. Prewashed hemp combined with Knickernappies' custom-milled microfleece makes a very absorbant, stay-dry doubler to use in any diaper. Knickernappies Just Hemp Inserts-Knickernappies Just-Hemp inserts are just that...just hemp! No fleece, no microfiber, just all-natural organic fibers. Just-Hemp inserts feature 3 thirsty layers of organic hemp...trimmer and more absorbent than other fabrics! Knickernappies Microfiber Inserts-Made with three layers of our ultra-thick microfiber, Knickernappies Microfiber inserts are absorbent and fit perfectly in most brands of pocket diapers. So whether you're looking for an overnight solution, a super trim daytime insert or an absorbent natural fiber insert like hemp, Knickernappies has what you need. Our retailers, worldwide, carry a great selection of our Knickernappies products! To locate a Knickernappies retailer near you, please visit our Retailer Locator.